Digital electronic dosimeters are used to measure, monitor and record personal radiation doses received by individuals, and to monitor environmental dose rate levels, usually with an alarm to warn when preset dose or dose rate levels are exceeded. Compact professional personal dosimeters, with shockproof rubberized case, designed to monitor and measure the personal dose equivalent Hp(10) and personal dose equivalent rate from both gamma and X-ray radiation. The PM1610 measures both continuous and pulse (from 1 msec) X-ray and gamma radiation in the energy range from 20 keV to 10 MeV. 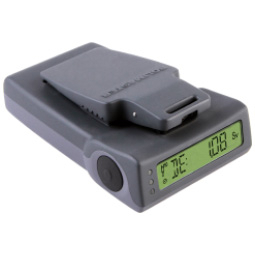 The instrument's non-volatile memory allows for manual or automatic recording up to 4000 events of the dose rate change, acute dose levels, time and levels when the present threshold values were exceeded; the dosimeter communicates with a PC via USB channel with simultaneous battery charging. The instrument is supplied with the Personal Dose Tracker software, that enables analysis of dose readings and report generation. The PM1610A-01 variation has an ISO15693 interface for use with different types of wireless readers. Compact professional personal dosimeters based on the popular PM1610A dosimeters, but using 1 x AAA (LR3) battery as its power source. With shockproof rubberized case, designed to monitor and measure the personal dose equivalent Hp(10) and personal dose equivalent rate from both gamma and X-ray radiation. The PM1610B measures both continuous and pulse (from 1 msec) X-ray and gamma radiation in the energy range from 20 keV to 10 MeV. The instrument is supplied with the Personal Dose Tracker software, that enables analysis of dose readings and report generation. The PM1610B-01 variation has an ISO15693 interface for use with different types of wireless readers. Electronic personal dosimeter for the measurement of dose equivalent and dose equivalent rate of continuous and pulsed photon radiation. Communicates wirelessly via a RF-interface, also via a USB-interface. 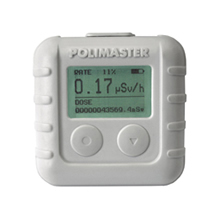 The dosimeter activates an alarm in case preset dose or dose rate thresholds are exceeded. Up to 10,000 events can recorded in the devices non-voltale memory. 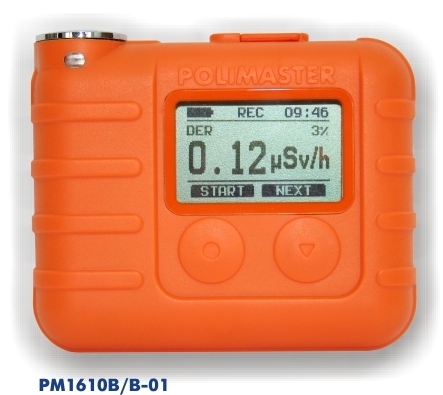 The PM1300 dosimeter is equipped with a wireless data exchange module (2.4 GHz) which allows the automated registration of personnel in the exposure monitoring system, simultaneous transmission of measurement results to the personnel exposure monitoring system from several dosimeters, remote control of the access, movement, location and duty hours of personnel in restricted areas, and integration to automatic access control systems. The reader may be located autonomously in different zones of the controlled areas, can simultaneously receive data from several dosimeters in the acquisition range, and may also incorporates in elements such as turn gates, information desks, etc. High sensitivity, compensated personal electronic dosimeter used for measuring X-ray and gamma radiation dose. Incorporates vibration and audible alarm to warn the user of elevated radiation levels; alarm thresholds can be set in terms of both dose rate and accumulated dose. Measures dose and dose rate (personal dose Hp(10) ) from photon radiation down to low energy X-rays (10 keV). Detector is a Geiger-Müller tube, with a dose rate measurement range of 0.1 µSv/hr - 0.1 Sv/hr (option for 1 Sv/hr maximum, model PM1621A) displayed on a backlit LCD. Data including dose histories and alarm events are stored in a non-volatile memory and can be downloaded to a PC via an IrDA (infra-red) port (software included). A clip on the rear of the instrument allows the user to wear the instrument on a belt or pocket. 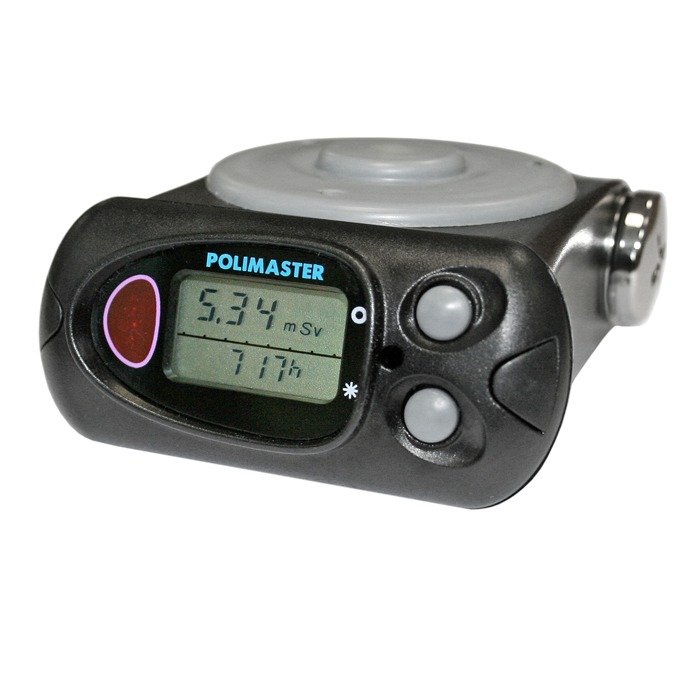 Compact professional digital dosimeters measuring dose and dose rate (personal dose Hp(10) ). Detector is a Geiger-Müller tube, with a dose rate measurement range of 1 µSv/hr - 5 Sv/hr (option for 10 Sv/hr maximum, model PM1604B) displayed on a backlit LCD. Incorporates both dose rate and accumulated dose alarms; flashes warning in the event of reaching maximum instrument dose. Data including dose histories and alarm events are stored in a non-volatile memory and can be downloaded to a PC via an IrDA (infra-red) port for personnel dose management and accounting (software included).